Lower oil prices are putting increasing pressure on Arab oil producers, and many pundits have been quick to blame US shale oil producers for the decline in prices and in Arab oil revenues. Shale oil actually contributed little to the decline in the price of oil that took place after June 2014. The use of hydraulic fracturing – ‘fracking’ – in conjunction with horizontal drilling has made it possible to extract crude oil from rock formations characterised by low permeability. Oil extracted by these techniques is commonly referred to as tight oil or shale oil to differentiate it from crude oil extracted by conventional drilling techniques. To date, commercial shale oil production has been largely restricted to the US. Increased US shale oil production over time has displaced crude oil exports from Arab oil-producing countries, both because the US no longer relies as heavily on crude oil imports from Arab countries and because US refineries have increasingly exported refined products such as gasoline or diesel made from domestically produced crude oil, causing other countries to cut back on their crude oil imports as well. These developments have lowered global oil prices, as measured by the Brent price of crude oil, resulting in a large reduction in oil revenues in Arab oil-producing countries. There is increasing concern about what a period of low oil prices might mean for the economic and political stability of Arab oil producers. There also is an ongoing debate about how oil-exporting countries such as Saudi Arabia should respond to this situation (see Fattouh 2014). The financial press has made much of alleged Saudi efforts to put shale oil producers (and other oil producers) out of business by not curtailing Saudi oil production. This overlooks the fact that Saudi Arabia has little choice in this matter – it wants to prevent its oil revenue from collapsing and the Saudi state-owned oil company is in fact not behaving any differently from private sector companies in similar situations (see Baumeister and Kilian 2016). Analysing the policy trade-offs faced by countries such as Saudi Arabia is difficult, if we do not know how large the effects of increased US shale oil production have been on the Brent price and, more generally, on Arab oil exports and revenues. By how much did the shale oil boom lower the global price of crude oil? In the public debate, it is common to attribute most of the decline in the Brent price of oil since June 2014 to the US shale oil boom, but recent empirical work on the causes of the 2014 oil price decline has shown that higher oil production elsewhere in the world, a global economic slowdown, and shifts in oil price expectations and storage demand have all contributed to this decline (Baumeister and Kilian 2016). The exact role of shale oil in causing this price decline has remained subject to speculation. There is no historical precedent for the shale oil boom. In a recent paper (Kilian 2016a), I compared this boom to the outbreak of the Iran-Iraq War in 1980, which was followed by an oil supply disruption of roughly the same magnitude, when expressed as a share of world oil production, as the supply increase associated with US shale oil. This supply shock was followed by an increase in the US price of imported crude oil of about 10%, which (after reversing the sign) would correspond to an decrease in the price of oil of about $10 in today’s oil market, providing at least a benchmark. have been lower if the shale oil revolution had never taken place. Figure 1 shows both the observed path of global oil production and where oil production would have been without US shale oil. I then determine – based on a commonly used structural model of the global oil market – what sequence of oil supply shocks would have been required to force global oil production to follow this counterfactual trajectory, assuming that all other shocks remain unchanged at their historical values. The model implies that under this counterfactual, the Brent price of crude oil since 2011 would have been higher by as much as $10 per barrel (see Figure 2). As large as this effect is, it pales in comparison with the decline in the price of oil that took place after June 2014. Moreover, shale oil actually contributed little to the decline in the price of oil since June 2014. How much oil revenue did Saudi Arabia lose to shale oil? Press reports put the reduction in Saudi foreign exchange reserves between mid-2014 and August 2015 near $90 billion. This estimate is considerably larger than the loss in oil revenue over the same period that is attributable to the shale oil boom. Given the estimates in Figure 2, the latter equalled about $24 billion. In other words, my analysis tentatively suggests that in the absence of the shale oil boom the reduction in Saudi foreign exchange reserves since mid-2014 would have been about two thirds of the actual decline with the remainder reflecting higher crude oil production elsewhere in the world, shifts in oil price expectations affecting demand for oil stocks, and the effects of a slowing global economy, as shown in Baumeister and Kilian (2016). In other words, shale oil matters, but it is only one source of the decline in Saudi oil revenues. There are indications that the Saudi government has dealt with the recent decline in its oil revenue mainly by tapping its financial reserves, as predicted by standard models of precautionary savings. An important question is how long Saudi Arabia can sustain such large losses. If we take the estimates of the decline in the Saudi foreign exchange reserves at face value, at August 2015 prices the Saudi central bank can be expected to lose about $15 billion in foreign exchange reserves every month. At this rate, one would expect the Saudi foreign exchange reserves to be exhausted by early 2019. First, unlike some of its neighbours, Saudi Arabia has very little external debt because it resisted the temptation to leverage its increased oil revenues during the 2003-08 oil price boom by running up external debt. As a result, for now, the Saudi government has been able to borrow in global financial markets, given the expectation that the price of oil will ultimately recover. Second, the Saudi government so far has been reluctant to impose fiscal retrenchment, because of the political costs of such measures, but in December 2015 it announced a budget plan that envisions cuts in spending from $975 billion in 2015 to $840 billion in 2016 (representing a 14% drop in government spending). The finance ministry also announced that it would raise taxes and adjust subsidies for water, electricity and petroleum products over the next five years. How much fiscal adjustment Saudi Arabia requires will depend ultimately on how long one expects low oil prices to persist. The answer depends in important part on why the price of oil declined and how important these determinants will remain in the future. For example, to the extent that this price decline was caused by the fracking boom, the relevant question becomes how long this boom can persist at current prices, with many commercial shale oil producers already experiencing heavy operating losses, and how quickly these firms could resume tight oil production at higher oil prices, if they were forced to close down. The same concern applies to unconventional oil production in Canada. Our evidence suggests that even if Saudi Arabia were to succeed in putting shale oil producers out of business by refusing to reign in its own oil production, this would do little to stem the losses in its foreign exchange reserves. Nor is it clear that it is possible to permanently remove the shale oil competition. An obvious concern is that shale oil production would resume as soon as world oil prices recover sufficiently. To the extent that low oil prices reflect a sluggish global economy, in contrast, the question becomes at what point emerging Asia, Japan, and Europe, in particular, will recover. A swift and sustained global economic recovery, unlikely as it may seem at this point, would quickly eliminate the current glut of crude oil, all the more so as oil production in many other countries will continue to fall over time, as conventional fields are depleted. Finally, to the extent that other oil producers including Russia and Iraq have expanded oil production, or, as in the case of Iran, are about to do so, the question becomes one of how long state-owned oil producers with few other options to generate foreign exchange and no accountability to shareholders or financial markets will put pressure on the price of oil. There have been recent talks between Venezuela, Saudi Arabia, Russia and other oil producers about supply restrictions, but all indications are that these producers are more likely to freeze recent high production levels than to agree on coordinated production cuts. Moreover, Iran is unlikely to feel bound by any such agreements. 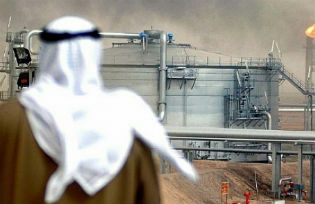 Regardless of one’s views about the relative importance of these determinants of low oil prices, it is likely that the Saudi economy could face another two or three lean years, at which point the precautionary savings in the Saudi sovereign wealth fund would likely be exhausted, while the prospects of new external borrowing would diminish. Thus, there appears to be no alternative to some measure of fiscal retrenchment in the foreseeable future. The same argument applies even more forcefully to other Arab oil producers faced with more foreign debt and lower foreign exchange reserves. A natural starting point for such reforms would be for policymakers to reduce or even phase out domestic subsidies on energy consumption. In fact, implementing such reforms is likely to be easier politically in an environment of falling oil prices. The United Arab Emirates, for example, have already successfully aligned their domestic fuel prices with prices in global markets. Other countries have yet to implement similar reforms. Baumeister, C, and L Kilian (2016), “Understanding the Decline in the Price of Oil since June 2014,” Journal of the Association of Environmental and Resource Economists 3: 131-158. Fattouh, B (2014), “The U.S. Tight Oil Revolution and its Impact on the Gulf Cooperation Council Countries: Beyond the Supply Shock,” OIES Paper WPM 54, Oxford Institute of Energy Studies. Kilian, L (2016a), “The Impact of the Shale Oil Revolution on U.S. Oil and Gas Prices,” forthcoming: Review of Environmental Economics and Policy. Kilian, L (2016b), “The Impact of the Fracking Boom on Arab Oil Producers,” CEPR Discussion Paper 11107. Lutz Kilian -Professor of Economics, University of Michigan; and Research Fellow at CEPR.